Cream together butter and granulated sugar until light and fluffy, about 3 minutes. Add Egg and Matcha and mix until well-combined. Scrap dough out of the bowl and onto a sheet of plastic wrap. Wrap the dough and put into the refrigerator for at least 1 hour, 2-3 is better, to allow the butter to harden again. This will keep the cookies from spreading out as much. When ready to bake the cookies, preheat oven to 350º F. Line cookie sheets with parchment paper or a nonstick baking mat. Scoop cookie dough by the tablespoon full and roll into a ball. Place each ball of cookie dough into the bowl of granulated sugar and roll to coat well. Place cookie dough onto baking sheet, spacing about 1½-inches to 2 inches apart. Lightly press each cookie down. If decorating, you can put on your hard candies now on the top of the cookies and press in. If you put in the gummy candies now, they may slightly melt creating a cool melted colored sugar effect on the top. If it is important to keep them hole, wait until you pull the cookies to add them. Bake for 8 to 10 minutes or until lightly browned. 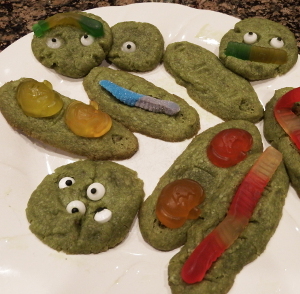 Remove from oven and decorate with the gummy candies while the cookies are still warm. Just lightly press the gummy candies into the cookies. Allow the cookies to cool on the tray before removing. Store the cookies in an air tight container in the refrigerator until you are ready to serve.